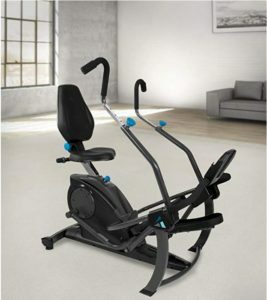 The Teeter Freestep Recumbent Cross Trainer is an alternative home workout bike designed to be low impact but delivering both cardio and strength training exercises. The Freestep is a full body workout workstation designed for individuals that may be experiencing joint pains or arthritis. Normal gym exercises for individuals dealing with joint pains can limit what you can do or how much you can exercise but with the Try Teeter Freestep the low impact design allows you to workout without the pain and discomfort. At their website www.tryfreestep.com the Freestep has over 93% ratings from participants that used the equipment twice for 7-10 minutes in a session for being low impact on your knees, back, hips, and compared to other cardio equipment options. Visit Amazon.com to read over 80 customer reviews where the product has a customer rating of 4.4 out of 5 stars. 70% of customers gave the bike a 5 star rating. Click to read reviews! When using the Teeter Freestep Recumbent bike you can have an effective stress free exercise without compression to your back, hips, or knees. You are combining cardio with strength training working out your legs and arms together or individually. The patented stride technology follows a smooth linear path to mimic a natural stepping motion. Instead of having the normal cyclical motion which increase joint strain which influences joint pain this technology prevents pain. 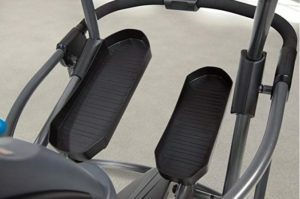 Your knees are prohibited from traveling over your toes while your back and hips are stabilized for a stress free workout. Resembles a leg press and exercises your thighs, glutes, quadriceps, and hamstrings. Adjusting the handlebars on Try Freestep creates an upper body workout targeting your biceps, triceps, chest, and upper back. Push-pull mechanics come into play with the handlebar adjustments as you can pull them forward or push them down isolating different body parts. You can manually adjust them anyway you see fit depending on your workout choice. While you are stepping to exercise your lower body simultaneously you can be working on your upper body as well. This feature allows you to adjust the intensity of your workout from low to high. All you do is turn the dial which is located beside your seat and you will go from a light workout to a maximum burn. The adjustment setting will accommodate various workout levels so the more you turn the knob the greater your workout intensity. 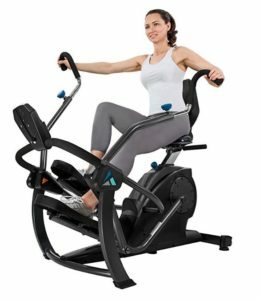 To make your exercising more enjoyable the bike has a few convenient features you will enjoy including a digital console with Smart Device stand and water bottle holder. You can place your tablet onto the device stand and watch or read any of your favorite content. The water bottle holder is great for keeping you hydrated while exercising. This entry was posted in Products and tagged try teeter freestep by bunky01. Bookmark the permalink.